Hate Mail is something every boxer has to live with. PvP is of course the most obvious source, as no one likes to be killed by another player with NO hope of winning. But we also get /reported all the time, assumed to be gold farmers, assumed to be cheating etc., but it's something you live with. It's worth it, for those moments when someone says "COOL! How are you doing that?" Over on my favorite forums, someone recently suggested a solution to some of the bashing we take... show off. He said he found that when he strolled into Org/IF and started to do formations, buffs, etc., that he made a ton of friends. So when folks started bashing him in /general, there were always several folks who would step in to explain what he was doing, and defend him! I took this to heart last night, while hearthing into Org to get some training. A group of players (all from the same guild) all came running to see what was up. I had just hit 33, so I had equiped my guys in their Robes and sweet shoulder pads from Doan in SM. Wow, what a visual! I noticed them all staring, and one suddenly said in /say "This is the coolest thing I've ever seen." I decided to put on a show... I pulled my guys out of the inn, got into formation, buffed myself with lightning shields, and dropped 15 Totems on the ground (I still have to go get their wind totem. They LOVED it. Folks from all over Org came running, and it turned into a huge dancefest. Everyone was really nice. Several had questions, which I answered in /say for all to read, and it couldn't of gone any better. I've used this "PR" tactic with my guild, For Horde. 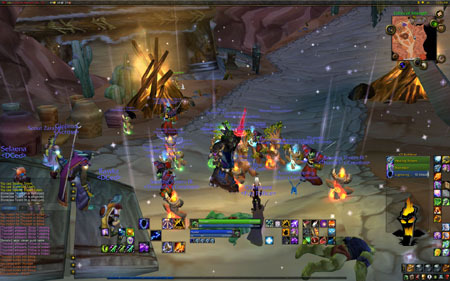 When we were still young, I forced all of our raiders to start each raid in Orgrimmar in a huge circle of 40 mounted players, then yelled out "FOR HORDE! 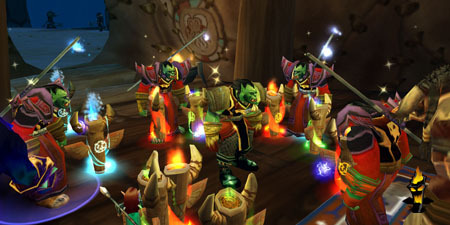 THRALL HAS ASKED US TO TAKE THE MOLTEN CORE FOR THE GLORY OF THE HORDE!" They would all scream back, and we'd head out to our raid. Every time we got a flood of tells asking about our guild, and how they could apply. Now to think up some cool macros for these "plays". Maybe a single button script that goes through a funny dialog between the 5! Great post buddy,, I run a 4 shammie + Feral druid team, (in their twenties now), so i'll deffinately be following your blog.. Keep up the good work, and good luck..
PS. I'll probably spec the druid moonkin later on. or should i stick with Bear tank, Any thoughts?.. I'm glad my suggestion of showing off worked for you :) Hope you had fun. The other thing I did which made people laugh, was have full conversations with the character. Like when someone says "LOL". "Guys, hes laughing at us"
"I think I can make a nice hat out of his skull"
"My cooking skill is quite high, I can cook him alive!"